We’re trying to create a world with sustainable First Nation communities and a healthy environment. 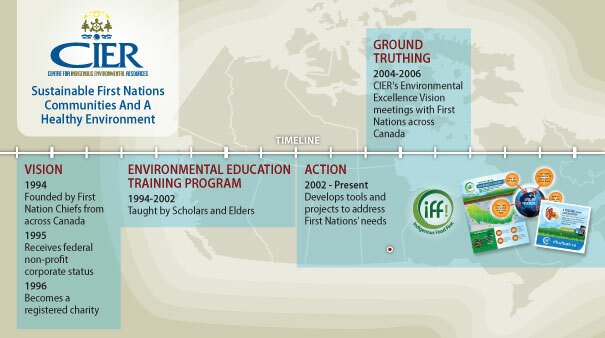 So, we help First Nations address the environmental issues they face. Since CIER began nearly 20 ago, we’ve worked on over 450 environment-focused projects with over 300 First Nations across Canada. We’re still the first and only First Nation national, environmental non-profit organization with charitable status in Canada. Indigenous food security is a part of our vision of sustainable First Nation communities and a healthy environment. Plus, it’s critical to indigenous wellbeing. We have food security “when all people at all times have access to sufficient, safe, nutritious food to maintain a healthy and active life”1. For First Nations in Canada, sufficient, safe and nutritious food includes indigenous food – food that’s hunted, fished or gathered by community people and has been staple to their diet for generations. Indigenous Food Systems are at Risk! Eating less indigenous foods can lead to a decrease in your health and wellbeing. The less indigenous foods we eat, the more we’re in danger of losing the unique and incredible indigenous knowledge tied to these food systems. Youth Need Tools to Make Change! First Nations youth are key to ensuring indigenous food security for First Nations peoples. They’re the fastest growing segment of the Canadian population – the current and future leaders, mentors, advisors and makers-of-change in their communities and throughout Canada.CIER recognizes that leaders need tools to help them reach their goals. We created iffculture.ca to help youth create positive change in their communities! Created with financial support from the Government of Canada. Thank you Canadian Heritage, Public Health Agency of Canada, and Aboriginal Diabetes Initiative, First Nation and Inuit Health Branch for supporting IFF.